Do you enter contests? Five years ago, I would have said that I never enter a contest. In the writing culture I was part of, it was unheard of to enter contests because an entry fee was frowned upon. I was told, "Never enter a contest that requires an entry fee because it's not worth it." Since I have recently won a couple writing contests, let me tell you the benefits of entering a contest. First, there is a deadline which means you must get a piece of writing done by a certain time. If nothing else comes from a contest--and certainly, you won't win every writing contest you enter--this is valuable. You have a finished piece of work to market other places besides the contest. And, if it never sells anywhere else, it was a valuable practice piece. Second, winning a contest can bring unexpected benefits. When the movie, THE HELP, was just coming out, they ran a children's story contest--and I won. It was a piece that I had tried to market and there was no interest anywhere. But the story fit the theme of talking about people who make a difference in your life. It's the story of a young girl whose father is stationed overseas for a year with the military. She decides that while her father is away, it is NOT a family photo album and she won't let any of the family photos turn out right until he comes home. 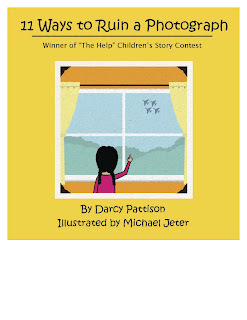 The prize for winning "The Help Children's Story Contest" was professional illustrations. While I had been indie publishing how-to-write books for while, I had never ventured into fiction--would never venture into it, because it was too risky. But--I had these great professional illustrations of my story. And really, what good are illustrations, if you don't use them? I learned how to prepare digital files for printing a full-cover picture book, and the result is 11 Ways to Ruin a Photograph. No, the book hasn't sold tons of copies, but it was a very, very low-risk entry into the children's picture book market for me. I also learned how to turn a children's color picture book into a Kindle version. Once you know how to do something, well, it's easier to do it a second time, right? 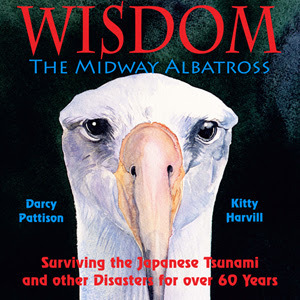 With my illustrator friend, Kitty Harvill, I decided to do a picture book about Wisdom, the Midway Albatross, the oldest known wild bird in the world and how she survived the Japanese tsunami in 2011. With Kitty's amazing nature illustrations, the picture book came together quickly. It seems that illustrators often enter contests: Kitty recommended that we enter the Writer's Digest Self-Published Contest. And we won! That turned into more attention and publicity and we are exploring further distribution. For self-published books, it seems that a slow build of momentum works better than the traditionally published tactic of bursting out of the gates. And the momentum is coming from winning that contest. Will I enter other contests? Certainly. But not every one. I will look at my writing and career goals and carefully pick and choose those that will enhance my other efforts. Find information on WOW-Women on Writing's Flash Fiction Contests here. Those unexpected benefits were great! Congrats on that. I also believe that having a deadline is so important in getting work done. Contests can be a great way to spark writing production. Excellent post. Contest and grant deadlines are more responsible for getting me to finish a project than anything else. I can't say enough about the benefits of entering (and placing!) in writing competitions. One of the books I won as a prize package in a Writer's Digest contest helped me complete the first draft of a novel. That was reward enough, although the accompanying check was nice, too! Good luck in all your future contests! Congratulations on your wins. I agree. My problem is all the rules. Sometimes, they overwhelm me. :( I know that's so silly. I recently entered a contest for a conference I am going to so I am looking even more forward to the conference.